This is my first Mother’s Day without my mother, Ruth Metzler Longenecker. To say I miss her is an understatement of the highest order. Technically, I could be considered an orphan with both my mother and father gone. However, with my own extended family and considering my age, I doubt that such a designation applies. Is there a word for my status without a living mother or father at my age? I wonder. 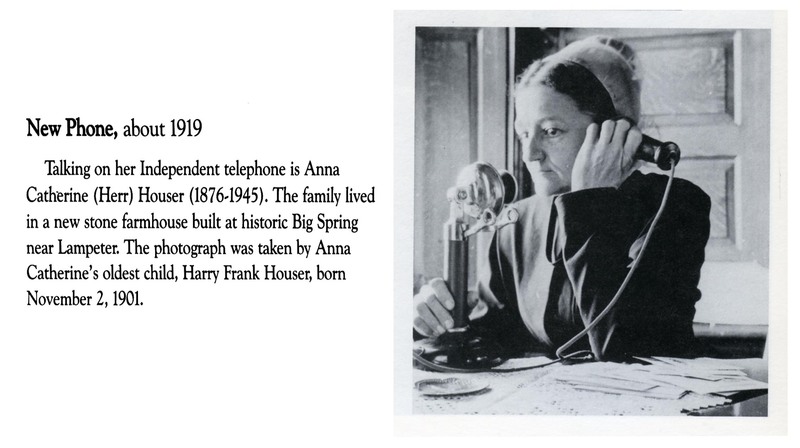 Anna Catherine (Herr) Houser was speaking/listening on this candlestick phone in 1919 at the time Mother was a year old. Credit: Mennonite Women of Lancaster County, Joanne Hess Siegrist, 1996, page 89. The last photo I snapped of Mother with her finger hovering over my iPhone captures the moment she looked up momentarily from “paging” through photos of her grand-children and great grand-children. 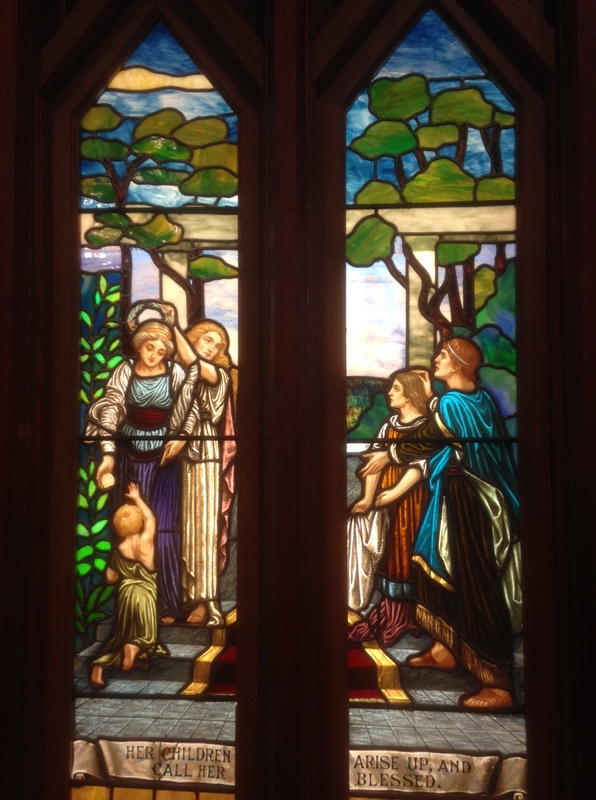 A “deep Hello to a more intimate imaginal relationship”? We’ll see . . .
Have you experienced the death of your mother or grandmother? If a mother, is there a word for one’s status now, bereft of a mother and father? Your suggestions always appreciated here. Oh, Marian, I’m so sorry. I know this is a tough one for you. As you said, technically you are an orphan. 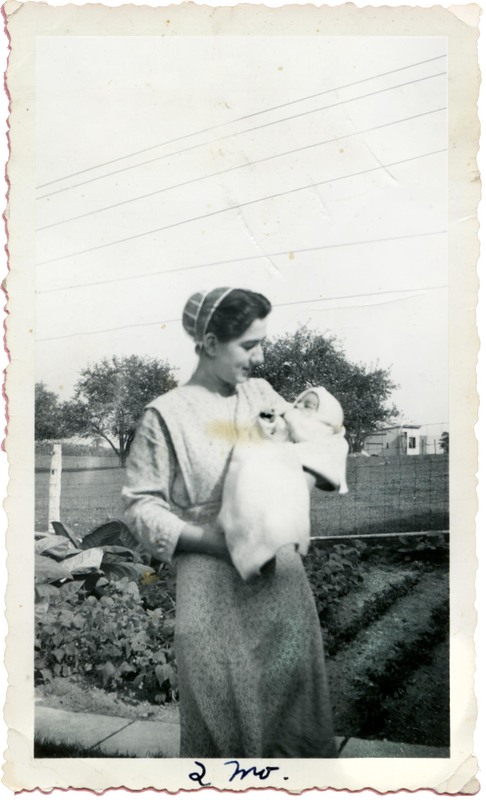 I recently read another essay in which a woman also pondered that term as she discussed how she missed her mother on Mother’s Day. Speaking of the dawning of the age of the telephone, our mothers would remember the party line that kept women connected, sometimes even secretly. Yes, I love Call the Midwife. Just as in Downton Abbey, the episodes keep pace with developing technology. Happy Mother’s Day to you, Merril. It’s been thirty years since my mom died suddenly and unexpectedly at age fifty-five. my experience has been that I continue to miss her and long for the opportunity to sit down and have tea and a visit with her. Time has softened the grief but it has not gone away. Instead it has become a gentler thing, a deep longing, a special remembering, an appreciation for having had her with me for the brief time I did. Thinking of you on this bittersweet weekend, Marian, and praying Gods comfort for you and yours. Memories, both great and small, are treasures. Thank you for reminding us of whatever we can cherish. Yes, “it has become a gentler thing, a deep longing, a special remembering.” Thank you for sharing, Linda. It’s been 8 years since my mother is gone. And yes, Mother’s Day is not quite the same. I remember the first year I did not buy a card. But we can both be thankful we had Mother’s who taught us right from wrong. Hopefully, you will have good memories this week-end. A few weeks ago, I looked at the Mother’s Day card display and felt a pang of sorrow. I won’t be sending a card this year. Instead, cards to my daughter and daughter-in-law, appreciating that they nurture the next generation. Bless you, Shirley! Good question,Marian, for which I have no answer. But your post reminded me how difficult it is to lose a mother at any age. Maybe the longer we have them,the harder it is let go? Kathy, we don’t have clear answers, so we live in mystery. I really don’t know that length of time makes a difference, but one thing for sure: appreciate them while you have them. Cherish the moments! Thanks, Kathy – and Happy Mother’s Day to you! Yes, Marian, cherish them while they are alive as I know you did with your sweet mom. The photo of you all is precious. Happy Mother’s Day to you,too. Enjoy your weekend with your sisters. I’m sure your mom’s loving spirit will be with you. What great photos, Miriam. I particularly enjoy the one of your mother and you. She looks so content and happy. You’re so fortunate to have had a mother who loved you. I know it must be difficult to face holidays that remind you of her absence. This post is a lovely tribute. Thank you, Cynthia. Yes, I know I am so fortunate. I do appreciate your showing up here today as always. Marian, My mother died eight years ago this month, and despite our difficulties, I do miss her. Every now and then I want I’ll call her to tell her a bit of exciting news or to just say high. My father is also gone, and being the oldest in the family I don’t know what to call myself. I hope you have a lovely Mother’s Day, surrounded by your own children and grandchildren. Neither of us know exactly what to call ourselves now, but we are indebted to each parent for the unique story woven into our own. I have a feeling your mother would be so proud of you, and so would your dad. Thank you for the good wishes, Joan. Thank you for this poignant reminder of our mothers Marian. Mine has been long gone. I often think of her and she comes visiting in dreams sometimes or just in my imagination and those are moments of grace I like to believe. I’ve lit a candle, now, in her honour because of your reminder. A Happy Mother’s Day to you Marian! And I imagine that you thought of your mother often as you composed the A-Z dream series, so inspiring during the month of April. I should think the first Mother´s Day without your mom would be hard. I am so lucky to still have mine. I think you would always feel an orphan no matter what age you are once both parents are gone. I know you will keep the tradition of good mothering going in your family. Happy Mother´s Day! Happy Mother’s Day to you too, Darlene. I believe this is your first celebration in Spain perhaps with different traditions but the same sentiment. Interestingly enough, Mother´s day in Spain was the Sunday before. We celebrated English Mother´s Day with my mother-in-law on March 15. So in fact I had 3 Mother´s Days! My treat was a Skype conversation with my daughter on Canada/US Mother´s Day. I called my Mother on Spanish MD as I knew she would be busy on May 10. Nice to have choices. You make the most of every electronic means possible to keep your family connected. When there’s a will, there’s a way. Three years ago, when my son and daughter-in-law went to Spain, we helped grandson Ian stay in touch via Skype. He would kiss the computer screen after every call. So touching. Yes, it’s nice to have choices. What an interesting post! Oh well, all your posts are interesting! This took me back to the day my mother died. I thank God that even though I live in Michigan and she lived in Colorado, I was with her at her moment of death. She was 99 1/2 years old, but her mind was sharp. The day before she died when my niece asked her how she was, she replied, “I’m fit as a fiddle!” 🙂 I miss her so. I miss her phone calls and visits. This is my second Mother’s Day without her. She’s been gone a year and a half now. So many elderly suffer before death. The “fit as a fiddle” comment attests to you mom’s good health to the very end. I am glad you were with your mother at the time of her death. Mother’s sudden illness and death happens so quickly, I missed those last precious moments, but by then she was not conscious. I had happy to have had conversations with her up to the day of her death, which I have recorded on an earlier post. I picked up this book after my mother died: Midlife Orphans http://amzn.to/1JXmY3l – It is what it is! We are, indeed, orphans and it’s a major transition for many of us. It felt to me like a protective layer had been removed and I stood really alone for the first time. This was at times empowering and at others terrifying. Our mothers are so very special to us – almost regardless of the relationship we had with them – but when there’s a special bond it’s all the more heartbreaking when we lose their living and breathing presence in our lives. I feel my mother at my side even though she is gone. She left so much of herself behind in my heart, as I know your mother did in yours. I will be thinking about you as you travel your path of grieving throughout the coming year. Thank you for offering the link to the book Midlife Orphans, a book (and concept) that is new to me. One of my friends mentioned that our status may be characterized as “beloved grateful daughter.” I think I’ll go with that for now, which sounds less self-pitying. Happy Mother’s Day to all. Hope you are able to spend it in a way that brings you joy. Thank you, Athanasia. My sisters and I are spending a loooong weekend in Charleston, S C, which I will write about next week. Yes, it is strengthening bonds, building memories, and bringing joy. Happy Mother’s Day to you too! I’m glad you have family that are celebrating YOU today. Happy Mother’s Day! I hear both the life coach and the love in your voice just now. We are celebrating together today. “What more can I ask?” I say with a full heart. Happy Mother’s Day to you tooooo, Laurie! One of my friends on Facebook referred to her status as “beloved grateful daughter.” I think I’ll go with that for now, which sounds less self-pitying; however, it certainly can’t apply for daughters with “problematic” mothers and/or fathers. Like you, I don’t think there’s a one-size-fits-all answer to this quandary. The first year after our loss is so hard Marian it breaks my heart for you . I lost my Mum 10 years ago and it feels like yesterday . I think I may have said in past posts My mum had serious mental health problems but when she smiled the world brightened . I can always remember her smile . When I go for walks , alone in the countryside , I imagine she walks with me and helps me with my problems but not as an elderly lady as the young woman I never knew before she was ill ….crazy I know but a comfort to me . Enjoy your memories of your Mum …you will never be alone with all your wonderful family and just remember each and every one has a piece of your mum in them so how can you be an orphan . I appreciate your empathy and your wisdom: “every one has a piece of your mum in them so how can you be an orphan.” And, yes, her legacy lives on. Thanks for helping me put things into perspective, Cherry. My mother died 21 years ago next month. She never saw most of her grandchildren – none of mine, who started arriving about nine years after her death. It is hard to lose your mother at any age. My dad died two years ago next month (their death dates are 5 days apart). So I too am an orphan, though I don’t call myself that. Our parents certainly saw many changes in their lives, and so are we. Change seems to be happening ever faster and it can be difficult to keep up. What will our children say of their mothers when we go, I wonder. Thank you for showing up here often. I do appreciate it! My mother has been gone for more than twenty five years now and my father for more than forty five. I guess we are both orphans, if elderly ones. Elderly orphans – there are so many of us with mothers and fathers aging. My father died about 30 years ago, but Mother passed away just last year. I am thankful my children grew up knowing and loving them both. I would prefer “older orphans.” You’re not quite elderly!! But I do hope you had some meaningful and good reflection time on this Mother’s Day in your new normal. Yes, the best therapy – surrounded by my sisters, daughter and niece for a long holiday weekend. I’m looking forward to hearing about your special weekend, Melodie! Hugs to you! I still have my mother – but I lost my beloved grandmother many years ago and often think of her and my aunt. I wonder whether you grandmother and mother were/are artistic like you. Both would certainly be proud of your brilliant photography and verse. I was praying for you (and many) this Mother’s Day. It’s a hard day for those who have lost their mom or child, through death or estrangement, and for those who want(ed) to be Moms. Blessings on you, my friend. It is a hard part of the journey! Thanks for caring enough to pray, Jenn – so very touching. 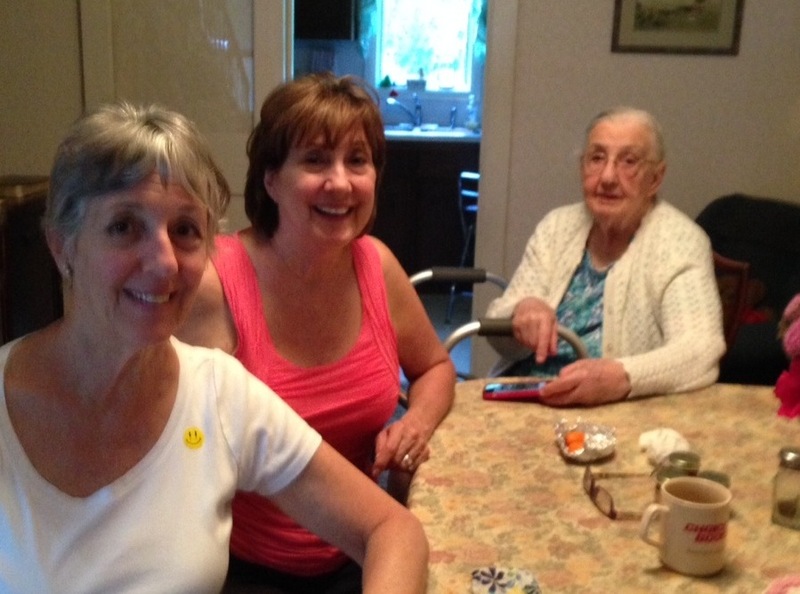 My sisters and I were together on Mother’s Day, itself a comfort. Yet I chose to wear black in her honor. I hope your day was special too.